Trader Joe’s Turkey Meatballs with Marinara Sauce that is. 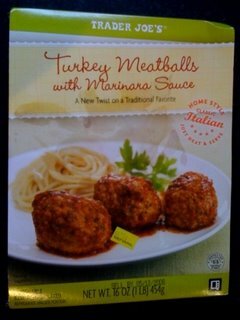 TJ’s has always had a yummy assortment of frozen, pre-made meatballs; however, now they have added fresh meatballs and other Italian classics to their arsenal. At $3.99 for a package of six, these meatballs are not quite as low calorie as their frozen companions… but MAN, are they GOOD! I decided to try these goodies a few weeks ago and I was pleasantly surprised. The meatballs taste homemade, with just the right amount of Italian seasoning and the marinara sauce is a wonderful addition. I do wish there was more sauce though, as you get perhaps 1-2 tbsp of sauce per ball. When I say I love these meatballs, it’s an understatement. They are ridiculously delicious. I am the type of person that gets sick of a meal after once or twice… so I don’t do well with leftovers. You will find them in the refrigerator section, near their hummus, fresh meats and veggies. Definitely worth a try!